Theresa's Crafty Creations: Dollar Store Wreath?? I have a super quick post today! and this seemed right up my alley! The colors are gorgeous in your wreath! And seriously, $6.00??? Your wreath is amazing! I saw this tutorial as well and love how yours turned out!!! Looking forward to seeing your Christmas one. Awesome job my friend. That is booootiful! Hope you are having a good week. 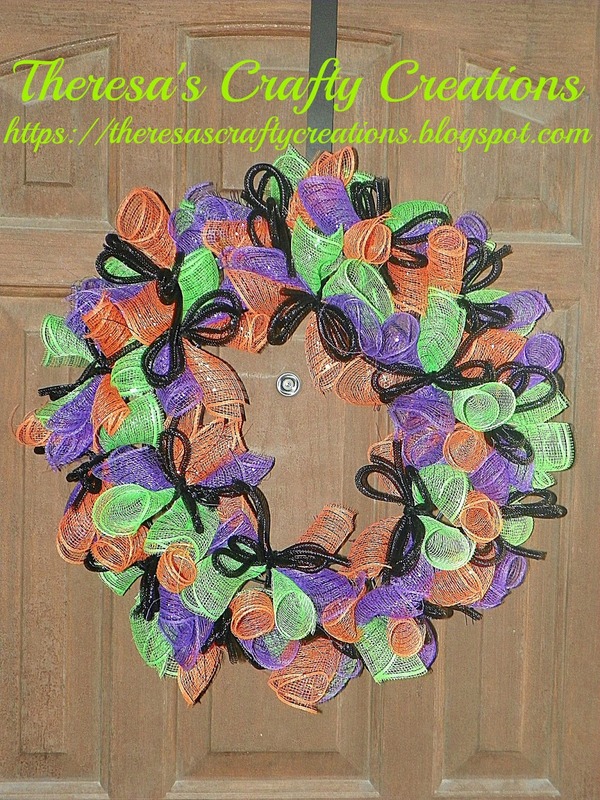 Love the bright Halloween colors and the black really makes them stand out! Gorgeous wreath! The texture looks amazing and so perfect for Halloween! I can't believe how quickly you created this! Your wreath is wonderful! Totally perfect for Halloween. I haven't ever made a deco mesh wreath. I have tons of floral supplies and since I don't make those things much anymore, I try to refrain from buying supplies in that department ;) I think I have too many crafting loves LOL! Love this! Love the colors! Can't wait to see the Christmas one! So awesome!! I love the colours and your creativity!